Making the most of a pantry depends on how you organise it. 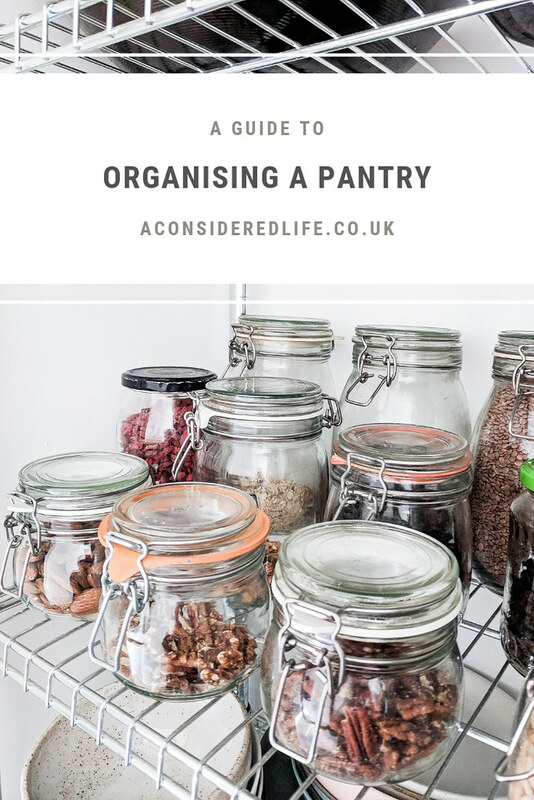 I’m using the term ‘pantry’ very loosely here; I’m referring to anything from a walk-in space to a few kitchen cupboards or even just shelves. Whatever you have, you can organise your staples nevertheless to create a functional kitchen. 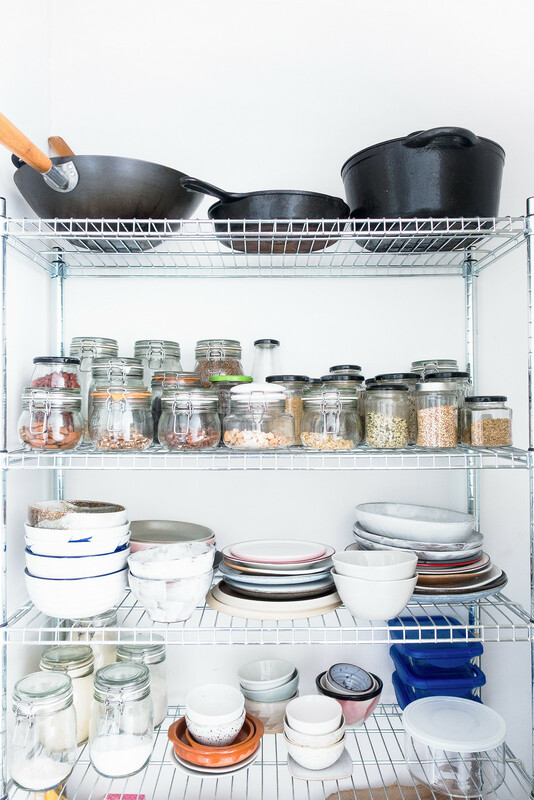 Things you might want to source or buy to organise your kitchen pantry: stackable baskets, jars, produce bags, storage containers, baskets, or racks. I've found these under shelf hanging baskets are super useful and these stackable can racks would help make better use of deep cupboards. I don't recommend buying anything new until you know for certain you need it, however, sometimes the best solution is storage that can help you make the most of your limited space. If you’re starting with a kitchen in chaos; take everything out, give all your cupboards and drawers a good clean, and start organising with a clean slate. Dispose of expired produce and out of date packets, and pass on anything you don’t want that’s still edible. Olio can help locate people who might want the food you don't. I think it's best to group similar items together and keep them that way so, if you're looking for something, you know exactly where it is. It's useful, therefore, to take the time to split all your non-perishable goods into sections such as canned goods (jars and tins), bottled goods (oils and vinegar) dry foods (pasta, rice, grains, and beans), baking ingredients, condiments, herbs and spices, tea and coffee. Group together items you tend to use together (tea with the tea pot; beans with the tinned tomatoes; condiments with oil and vinegar) and keep these things side by side. Decanting produce into containers and jars doesn't just make your pantry look pretty, it can also help make organising your kitchen easier because there's no awkwardly shaped packages and bags getting in the way. Going through everything you own, you might realise you have overstocked on certain ingredients; decanting into reusable containers means you can consolidate multiple packets into one box or jar that take up less space. Even if you don't shop at a bulk store where you can shop packaging-free, decanting your food into containers is still useful for keeping your kitchen organised. Jars, pots, and boxes can be stacked enabling you to make the most of any deep cupboards you have. It also helps keep pests away. I would like to make it very clear that you do not need to buy special jars or storage containers to do this. Reuse empty jars from pickles, dips, and spreads; make use of old plastic tubs and pots; repurpose household objects such as trays, pencil holders, and baskets. Clear containers work best as you can see what they contain at a glance, or otherwise use boxes and pots with clear labeling. There's also nothing wrong with investing in storage solutions that enable you to make better use of the space you have. Once everything has been categorised and decanted, it's time to put everything back in a way that's practical and makes sense to you. Consider where you can store food and spaces so that they're easily accessible while keeping the ones you use frequently close to hand. If you have a kitchen large enough, there's little pressure to get things right the first time since moving tins and containers from one cupboard to another doesn't take much effort. However, if you have to split your food ingredients up between awkwardly placed shelves and oddly shaped cupboards, it might be a little more challenging to organise things and require some careful thought. I can't really tell you how best organise your kitchen, I can only share with you how I organise mine. For instance, I keep spices on a bar cart under the main work surface, tinned goods in a cupboard with the pasta and rice, and tea and coffee in a separate cupboard together with tea pots and coffee strainers. I have a separate cupboard outside of the kitchen, which is where I keep most of my less frequently used goods such as baking ingredients, dried fruit, nuts and seeds, oats, and lesser eaten grains. Find sensible places to store the things you don’t use regularly like cake tins, baking trays, and utensils. Find a spot that's out of the way but not inaccessible. Mine are kept in an awkward cupboard in the kitchen, discreetly tucked away but not out of sight. In my tiny kitchen, I make use of wall space and the back of the kitchen door with hanging racks to store useful tools. Rarely do shelves and cupboards stay tidy in a busy kitchen without some effort. As you hunt for ingredients and pull out bottles, jars, and packets, you’ll find all your organisational efforts were in vain unless you assess the space regularly. If you notice something isn't working, change it. If you're finding ingredients hard to locate or tins a struggle to fetch from the depths of a cupboard, reconfigure your set-up until it works for you; you'll find it easier to keep a kitchen tidy when it's functional. A pantry inventory might not be for everyone (it's certainly not for me) but keeping a mental note of what you have and what you need is a good idea to prevent over buying ingredients or missing goods off your shopping list. Make it part of your routine to scan what you have before meal planning for the week ahead. Knowing what you have and what you need will keep your kitchen running smoothly. You might want to write a list of what you have or, like me, keep a running digital list of things you need, which you can share with the household. I have a checklist I share with my partner, when we notice an ingredient is running low we add it to the list for whoever goes shopping next.